A map of Barbados is a handy tool when traveling to this beautiful island and its unblemished coastline of beautiful white sands. Of course, in the song, Jimmy never makes to Barbados, and I can say from experience, that is definitely his loss! Of course, had he used one of our Southern Caribbean Island Maps, he would have known that Barbados is in the southern Caribbean, on the eastern edge of the Caribbean Sea. It is part of the Caribbean islands known as the Lesser Antilles, and is 100 miles (160 kilometers) east of the Windward Islands. 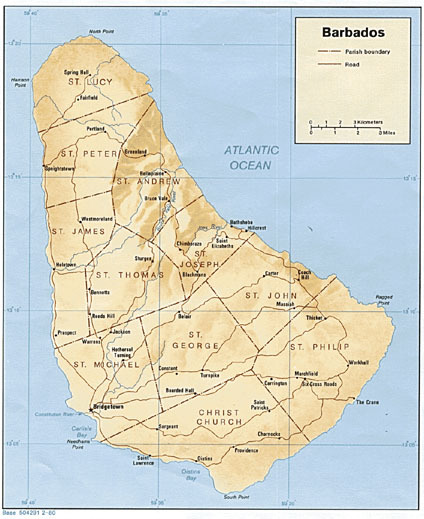 Barbados covers a land area of approximately 166 square miles (430 square kilometers). Then, once he sailed into Bridgetown Harbor, our maps of Barbados would have sent him to some of the best shopping (for those presents he needs to send) and beautiful scuba diving locations in the world! We present several different Barbados maps to help you find your way, from static maps to the latest in interactive satellite imagery from Google. So whether you are shopping in Bridgetown, the nation's capital, or looking for a scuba adventure we have a map to help you find your way.